Behind every donkey owner there is nearly always someone whose help is invaluable and these people are often unsung heroes. The West Region now has a new trophy – The Gofur Trophy, to be awarded each year to an indispensable assistant. The first recipient is Peter Scales in acknowledgement for all the years he has assisted his wife, Angela with her donkeys. Every year in the West Region a large cup is presented to a donkey who for some reason has proved to be ‘special’. 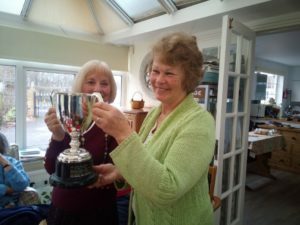 This year Anna Turner received The Special Donkey Cup on behalf of her donkey Henry Redfers. 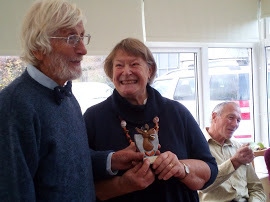 Henry has for many years, participated in fund raising events and parades and frequently attended the Malvern Autumn Show where he has been an excellent donkey for people to meet. By now members will have heard from Claire Harper that they can now receive her Newsletter via their Area Representative by e-mail, rather than by the more expensive postal route, if that is your choice. If by any chance you have not made and notified the choice please set it up now. We hope that by involving Area Representatives in the distribution we shall bring members more in touch with their own representative. It is important that e-mailed Newsletters are downloaded, printed out and filed in your DBS records for future reference. It is all too easy for e-mails to become lost, if left to linger in an In Box.